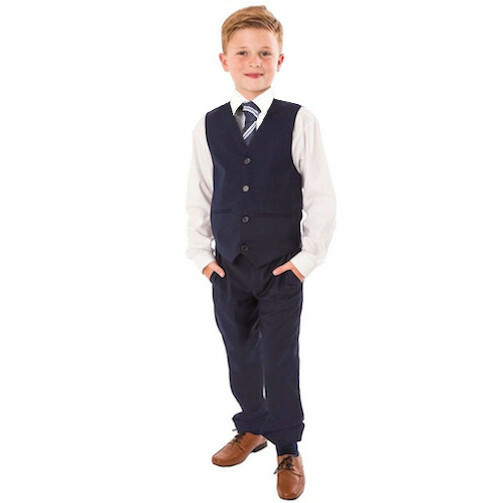 Navy 4 piece trouser suit with tie, for baby boys, toddler or older boy, perfect for a pageboy, guest at a wedding or other special occasions. Trousers: Pleated navy trousers, double pockets, belt hoops, elasticated on rear for comfort. This 4 piece outfit will make him look like the perfect handsome gentleman. The perfect suit for a ring bearer or pageboy to match up with the ushers and groom in the wedding party. 0-3 Months 20.5cm / 8" 35.5cm / 14" 41cm - 45.5cm / 16" - 18" 43cm / 17" 51cm / 20" 16.5cm / 6½" 20.5cm / 8" 24cm / 9½"
3-6 Months 23cm / 9" 38cm / 15" 41cm - 45.5cm / 16" - 18" 45.5cm / 18" 57cm / 22½" 18.5cm / 7¼" 23cm / 9" 27cm / 10½"
6-9 Months 24cm / 9½" 39.5cm / 15½" 43cm - 48.5cm / 17" - 19" 49cm / 19" 58.5cm / 23" 20.5cm / 8" 24cm / 9½" 28cm / 11"
9-12 Months 27cm / 10½" 42cm / 16½" 43cm - 48.5cm / 17" - 19" 53.5cm / 21" 61cm / 24" 20.5cm / 8" 27cm / 10½" 29cm / 11½"
12-18 Months 28cm / 11" 43cm / 17" 45.5cm - 51cm / 18" - 20" 56cm / 22" 63.5cm / 25" 23cm / 9" 28cm / 11" 30.5cm / 12"
18-24 Months 31cm / 12" 47cm / 18½" 45.5cm - 51cm / 18" - 20" 56cm / 22" 66cm / 26" 25.5cm / 10" 30.5cm / 12" 30.5cm / 12"
34cm / 13½" 51cm / 20" 48cm - 53.5m / 19" - 21" 57cm / 22½" 67cm / 26½" 27cm / 10½" 34cm / 13½" 32cm / 12½"
3 Years 37cm / 14½" 56cm / 22" 48cm - 53.5cm / 19" - 21" 61cm / 24" 68cm / 27" 31cm / 12" 37cm / 14½" 32cm / 12½"
4 Years 44.5cm / 17½" 63.5cm / 25" 51cm - 56cm / 20" - 22" 63.5cm / 25" 73.5cm / 29" 32cm / 12½" 39cm / 15½" 32cm / 12½"
5 Years 45.5cm / 18" 65cm / 25½" 53.5cm - 58.5cm / 21" - 23" 66cm / 26" 76cm / 30" 33cm / 13" 41cm / 16" 33cm / 13"
6 Years 49cm / 19" 68cm / 27" 53.5cm - 58.5cm / 21" - 23" 68cm / 27" 76cm / 30" 34cm / 13½" 42cm / 16½" 33cm / 13"
7 Years 53.5cm / 21" 73.5cm / 29" 56cm - 61cm / 22" - 24" 70cm / 27½" 77.5cm / 30½" 38cm / 15" 45.5cm / 18" 35.5cm / 14"
8 Years 57cm / 22½" 77.5cm / 30½" 56cm - 61cm / 22" - 24" 71cm / 28" 84cm / 33" 39.5cm / 15½" 49cm / 19" 35.5cm / 14"
Great outfit for a special occasion!! Love using this website for special occasion outfits for my little boy. 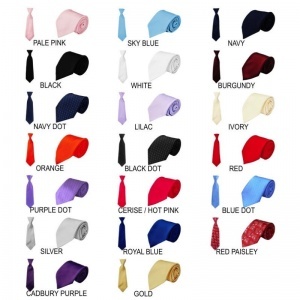 They are great quality, stylish, and reasonably priced given how quickly children grow up. Love this navy suit and looking forward to seeing my son in it for a family wedding next week! Thanks again!! Would recommend (and have done) this site and product to anyone!